Html Parser .NET is a .NET component that allows to analyse and manipulate HTML documents (HTML, XHTML) and Cascading Style Sheets (CSS) in desktop or website applications (C#, VB.NET, ASP.NET). The set of API functions allows developers to parse HTML + CSS documents, screen scrapping of HTML pages or data extraction from the web sites. Imbedded CSS parser helps to analyse style attribute or corresponding CSS styles for certain HTML tag, class, id etc. The parsing of badly formatted HTML, which makes the component ideal for use with "real-world" HTML that chokes other parsers. Variety of source data type: string, stream, file, URL. It allows to implement parsing HTML content directly from a web site or offline HTML pages. Html Parser .NET component requires only .NET Framework. The code of Html Parser .NET component is fully managed and works under .NET Framework started from 2.0 version. Developers can create C# / VB.NET applications or deploy website on servers with medium-trust level. 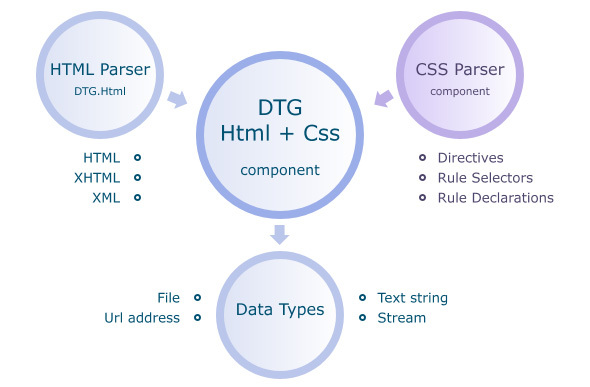 The schema of Html Parser .NET - supported file formats and data types. The PRO version includes CSS parser.